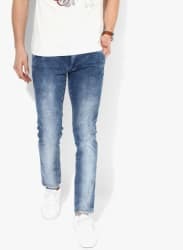 Look stylish and feel comfortable by wearing these blue coloured jeans for men from United Colors Of Benetton. Made from cotton spandex, these skinny-fit jeans are comfortable to wear and trendy in look. You can team these jeans with a T-shirt to complete your casual look.